The CoffeeShop Blog: CoffeeShop "Independence" Digital Paper Pack! 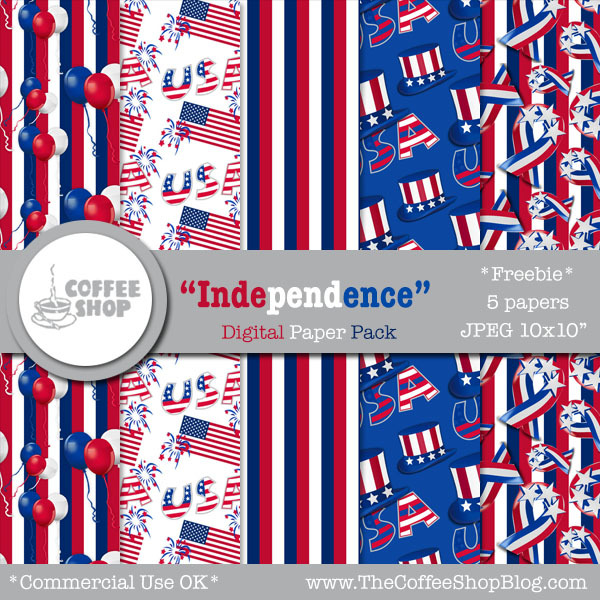 CoffeeShop "Independence" Digital Paper Pack! Today I have a brand new 4th of July-inspired digital paper pack. This one has five 10x10inch papers and you can use them anywhere you want, digital or printed. I would love to see your own creations using these papers on my Facebook page! I plan on making another set this week, so if there is something specific you want to see please leave a comment. Download the CoffeeShop "Independence" digital paper pack. You can also download it here. Thank you so much for all you do and give. thank you so much for all that you do. I would not be able to purchase all these actions that you offer for free. Thank you!